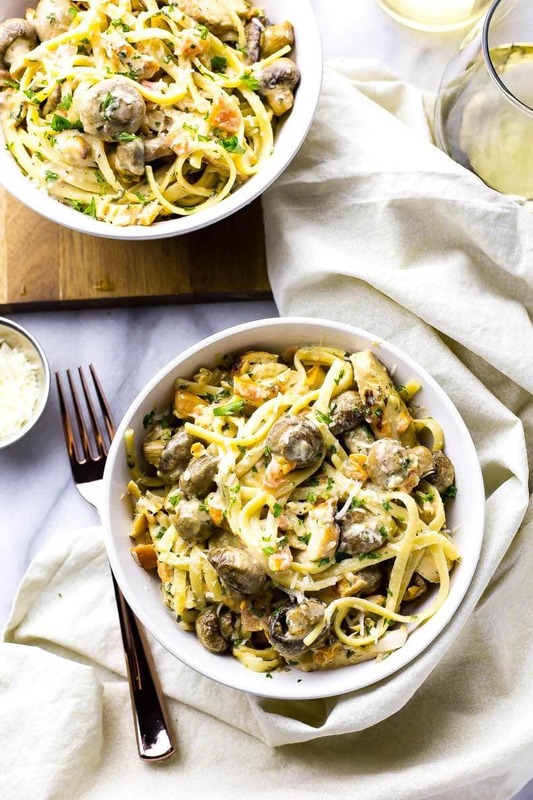 This Linguine Chicken Tetrazzini is a delicious and luxurious pasta dish filled with roasted garlic mushrooms, bruschetta, fresh parsley and grilled chicken! Preheat grill to med-high. Add chicken and grill for 7-8 min per side. If not using BBQ, preheat oven to 425 F. Place chicken in a small oven-safe dish and cook in oven for 20 min. Once chicken is cooked, let cool then slice across the grain into bite-sized pieces. Meanwhile, make bruschetta by mixing all ingredients together. Preheat oven to 450 F and toss olive oil, mushrooms, garlic and a little bit of salt and pepper in a large bowl. Transfer to a parchment-lined baking sheet and bake for 25 min, stirring every so often. Mushrooms can be made ahead of time and refrigerated for up to 3 days. Cook pasta according to package directions. Meanwhile, melt butter in a medium-sized saucepan. Add flour and whisk to combine. Slowly stir in milk, whisking along the way. Add cream and stir. Wait until mixture comes just to a boil, then add cheese, salt and pepper. Drain pasta, and add to cream sauce. Add bruschetta, garlic roasted mushrooms, and sliced chicken, tossing to combine. Cook mixture for another 3-4 min until all ingredients are hot. Remove from heat and stir in parsley. Serve and enjoy!